I subscribe to both Teams & Families. Each has a 'Personal" vault and I cannot change the name. This makes it very confusing & slows me down when working to ensure I am using the appropriate vault. Can we rename these? We've had some requests to rename the Personal vault, and we're looking into doing that. If you could rename them, what would you prefer to do? We've discussed a few possibilities and they're not working in most cases, so we're open to new ideas. Would just like the ability to rename the default one. I use other family member names hyphen "Personal" (Name - Personal) to differentiate between users personal vaults, but it is confusing that the default one (mine) cannot be renamed (which is only a tag) to follow this nomenclature. @Darkstar666 Thanks for the feedback. What kind of format are you looking for? I'm curious because it would be nice if things were consistent for every user. Having a personal vault that is named according to that user's preference can be difficult to troubleshoot and document, because we don't see vault names on our end — they're encrypted — and we want to make sure folks know which vault is theirs. I wasn't looking for a format that you would populate personal vaults for me. Assumed that as vaults are created they would have a default display name (Personal , Personal 1, Personal 2 etc), and then we as users would have the ability to change the tag so that the default vault (Personal) would appear as a name that means something to us, so personalised, but at the back end, it still shows as Personal, even if it is encrypted. Okay, good to know. To clarify, the reason we'd prefer not to allow renaming of it isn't for the naming on our side, it's for documentation. So when you read something that says, "Your Personal vault is only viewable to you" we want to make sure you know which one that is for consistency. If folks renamed it and had other user-created vaults they might lose track of which one is which. I'll let the team know you asked about this, all the same. Maybe it should be called an "individual" vault? It would really be better if we could just name it what we want. I use 1Password for both personal and work purposes and I try to keep them separate so it's very confusing to have a "personal" vault on my work account. Thanks for the feedback. We are considering that as an option as well, but at the moment we're looking to rename it to something that will work for everyone by default. We're certainly open to other approaches though. I am also testing switching to use of both Family and Team accounts, and also find that the inability to rename the personal and shared vault names is a problem. The explanation that they are underneath different parent folders is not useful or a solution - the vaults appear in drop-down menus with just their name, where you can't see which section they're under, so it's confusing what Personal means in that context. I haven't gotten into playing around with the Team account I just setup, but I've already hit an issue with an inability to rename the Shared Vault in my Family account. I want to use that for objects which are shared across my entire family, but want to have a different vault for objects only my wife and I should see. I'd like to change the name of my Personal to "Michael", the standard Shared to "Family" and create a new vault shared with my wife named "Parents". This is to insure these Vaults are clearly marked when I go to work with Teams (in parallel with Families at least for me, and likely other employees), where I'll be testing the setup of multiple different groups which partially overlap. Whoever had the idea of creating "Personal" and "Shared" - common names - without the ability to rename them - must not have much experience dealing with complex organizational structures where people are likely to be using many accounts and vaults. If this tool is to become usable in larger organizations (I work for HP Enterprise), you MUST allow renaming of ALL Vaults. I just read some of the comments by Jacob above. I found them somewhat distasteful, in that he seems to be putting "ease of documentation" or "reduction of idiots bothering the support desk" above usability of this product by customers. Please listen to what your customers are asking for, Jacob. If you're concerned this will create confusion or increase support calls, that's a different problem to solve. Perhaps you could use Personal* and Shared* with the footnote "* Unless changed by the user" in documentation, and/or some type of warning dialog when a user goes to change the default value to indicate the documentation's references to Personal and Shared should now mean the new names, to address your concerns. But, please don't dumb down features which your customers have a valid reason for requesting to satisfy the idiots in your user base. You can't fix stupid - anyone who can't make this tiny mental leap is going to have bigger things they're confused about. You will constantly get requests to add the ability to change these names until you add this feature, because it is needed by sophisticated users in non-trivial settings. Have an expert mode if you must, but please add this. I thought that I'd hop in here and give a bit of background. 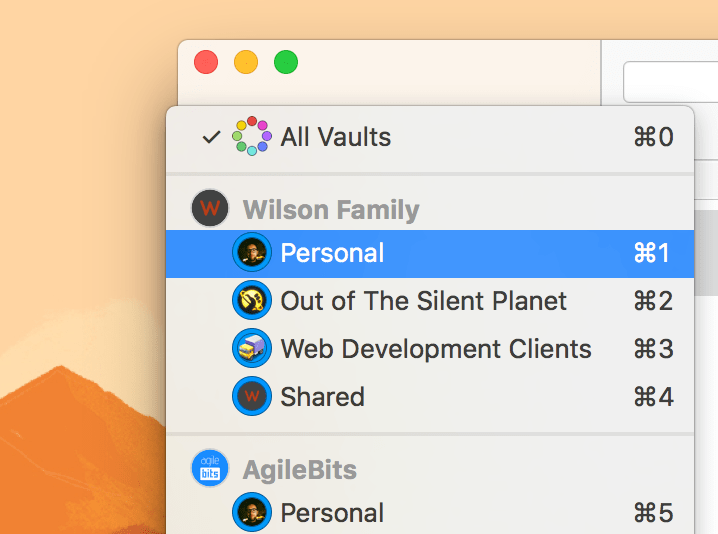 The naming (or re-naming) of our Personal vault in particular has been one of the biggest discussion points that we've had internally with 1Password. Seriously. We've had hours of discussions about this in large part because we are listening to folks like yourself who are dissatisfied with the names. I don't think any of us are satisfied with the name Personal but admittedly we have really struggled to find an alternative that any of us are happy with. We've considered everything from "Private vault", "Individual vault", "Team member vault", "Your vault", "My vault", named vaults (Jeff's vault) and more. Each one we come up with has a number of problems, especially as the name is the same across 1Password Individuals, Families and Teams. Our concerns with each name are many and I won't go into the tons of discussion we've had, but I do want to say that Documentation is indeed one of those concerns. For example, naming the vault "Jeff's vault" is kind of nice for the user but makes it very difficult when trying to help them. We can write documentation or support emails with "Please look in your Personal vault", but as you might imagine it becomes much harder to write "Please look in the vault that starts with your name". It would be really nice if we could come up with a name we were all happy with and that was easy to include in the documentation/support. Personally I don't see this as dumbing down the solution but rather an attempt to keep the solution simple and effective for all. Sadly I don't think we can achieve that goal in this case. First - we will almost certainly change the name "Personal" to a different name, and likely a different name based on whether it is an Individual, Families or Teams vault. Secondly - I agree that allowing customers to change the name of the Personal vault is something we need to allow. @wkleem: Yeah the forum software has some issues with usernames that include spaces. I think Shiner should change his to accommodate us. I think while "Primary" is certainly what a lot of us are used to, it woulnd't really carry much significance with regard to 1Password.com. Additionally, I find it's really helpful to be able to draw the distinction between 1Password.com vaults and the Primary vault, which is always local and not associated with an account. Really this is just another opinion though. Hopefully we can come up with a good solution that makes things clearer to everyone. I want to rename a vault but can't find the edit icon on the vault - I've been to the actual vault, found the fault through the admin panel, found the vault through the dashboard, still can't find an edit button on any of them (only an edit for the image in the vault icon, not the name). I just switched to a family account, and can't have everyone's vault named 'personal' . Thanks for writing in for help! Your question is actually a bit different from the topic of the discussion in the previous thread, so I moved your post to a discussion about changing the name of the Personal vault in a Families/Teams account. I hope you don't mind! Other posts in this thread go into a bit more depth about this, but in short, the reason you aren't seeing the option to rename the Personal vault is because that option isn't there - the Personal vault cannot be renamed. Sorry for any confusion about that! I can certainly let our developers know you'd like to be able to do that, although I can't make any promises about if or when that might be possible. If you have more questions about that or need help with something else in 1Password, please be sure to let us know. Cheers! Perhaps the Personal and Shared Vaults could always have the "Personal-" and "Shared-" prefix, but allow the user to add a suffix? So I could name my work and home personal vaults "Personal-Work" and "Personal-Home". Hi @LaraStone - Thank you for reaching out to us and sharing your idea for renaming the vaults. We really appreciate you taking the time to write in to us :-) I will make sure to share your feature request with the team. Happy New Year and thank you for supporting 1Password. Have a fantastic day! Indeed! Why didn't I think of that? Has anymore movement or progressions been made on this? I am just starting out with a Family account and Team account and making sure passwords make it into the right “Private” vault is annoying still. Even with the names portion in a lighter color. But a simpler distinction than a very small icon to the left. @gfgartland: I may be misunderstanding, but your own 1Password Teams vault should be called Private, and the 1Password Families vault called Personal. And you'll also probably have different icons for each based on your account profile. Is that not the case? @brenty that is not the case. Both user vaults are named “Private”. Yes, they do have different icons, but the icon is very similar when presented so small in the save modal/window. @gfgartland: Thanks for letting me know. We may make it possible to differentiate these differently (that sounds weird) in the future. In the mean time, you can always change the icons if the ones you chose don't "read" as well as you'd like. I find colour-coding helps me a lot, but it's really a matter of personal taste. The feedback is appreciated! It's years later and still a problem. Allow us to call it whatever we want. It's the kind of thing that should be in our hands (and not the result of a committee!). Badging the vault icon with something unique to identify it is an interesting idea. Thanks for sharing, @cmroanirgo.